The new purchases come with risks. 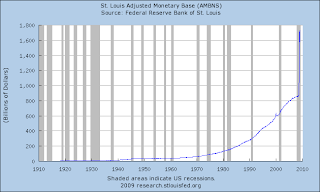 They will balloon the value of the assets the Fed holds by about 50 percent, to more than $3 trillion. That could make it tricky for the central bank to draw that money out of the system once the economy starts to recover. The Fed would probably find it difficult to sell such massive volumes of assets, and if it doesn't handle the task adeptly, the nation could face high inflation because too much money would be in circulation. 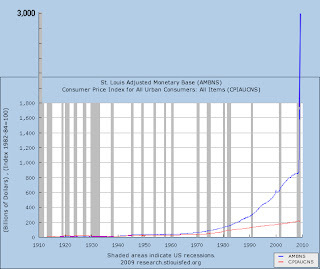 The money supply and the CPI track pretty well over time, especially since the abandonment of the gold standard. 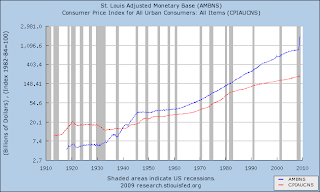 But look at the spike in the money supply recently, one that hasn't yet had time to have an impact on the CPI. The plans are awe inspiring in their scale, but they are different only in degree rather than kind from the steps the Fed has already taken. The Fed is staying true to its script, just like the Obama administration. The mantra that is repeated endlessly in Washington is "we have to do something!" and the only guidance anyone there has is Pragmatism. Don't look at history, don't do what is right; just do something, anything! that might work right now. What will happen in 9 months? Who cares? As an economist from Credit Suisse was quoted in the Washington Post article, "When the house is burning down, you put out the fire. If in the process you get the furniture wet, you worry about that later." I could be wrong, but that analogy just makes me think of putting the entire U.S. economy on the block in a fire sale. Not to worry, though. Good old John Maynard Keynes gave us the guidance we need when he said "In the long run, we'll all be dead." Indeed, Johnny. Indeed.